Baking, Cooking & Eating, Holidays, etc. No more yawns. No more yearning with desire for cousin Merle’s tamale pie that he used to make a decade ago and that was filled with such a delicious melange of herbs and spices that all your older relatives are all like why can’t you be more like Merle?. Bring this to the table and step out of that guy’s shadow. 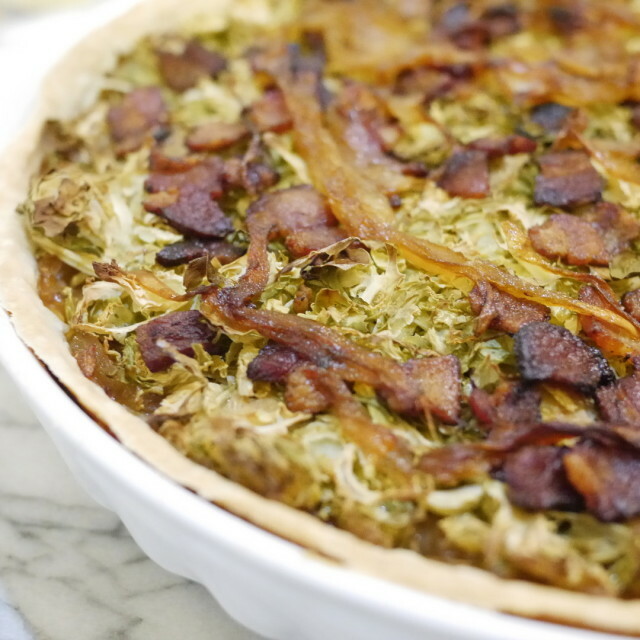 Bring this to the table and bump the turkey out of the way — because who needs some dry old fowl when you’ve got the new and improved, extra-fancy-but-super-down-to-earth Twice Cooked caramelized onion tart, 2014 edition? Not you, that’s who! So act today, friends. 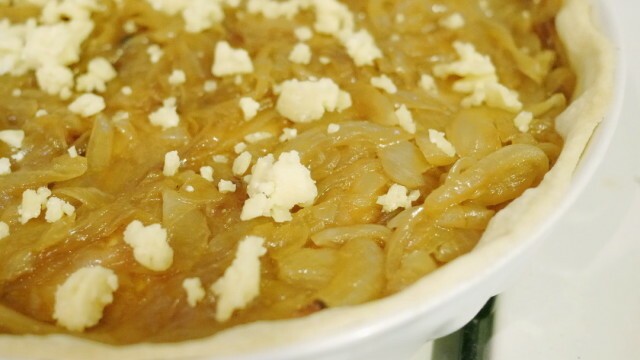 Follow this simple recipe and get your own easy-to-make, easy-to-love caramelized onion tart, ready to feed you and your seven closest friends. Or make two — or four! — and fill your extended family up with sweet and sharp; fill up your entire block with delicious and nutritious smoky bacon goodness. Cook now! Quantities are limited! 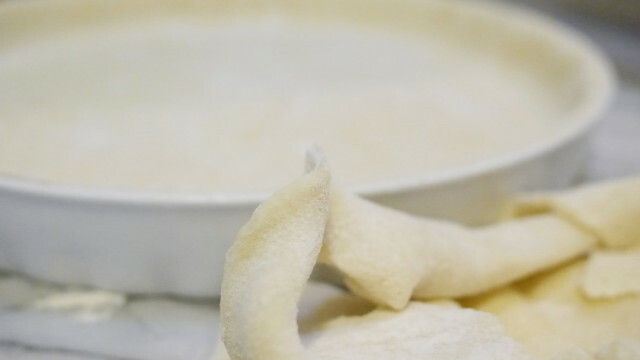 Make your shortcrust pastry according to the instructions given here. Allow it to rest in the refrigerator for about an hour, then roll it out and fit it into a tart pan. Poke the bottom all over with a fork, refrigerate the whole thing for another hour to allow the gluten to relax, then blind bake at 350F for 20 minutes. Remember: when you’re blind baking a crust, line it with parchment and fill it with pie weights or dried beans or it will get poofy on the bottom and unusable. To make the filling: Heat a cast iron pan over a low flame. Lubricate with olive oil and add your four shredded onions. Salt, and allow it to cook, stirring occasionally, for about 45 minutes. You will know the onions have caramelized and are done when they are limp almost to the point of melting, and when they are all an even medium brown color. When they are done, add about 20 grinds of pepper and remove the onions to a bowl. In the same pan (or in a new one) cook the bacon over medium heat until it is crisp. Then remove that to a bowl, too. To put the tart together, spread about half of the cheddar cheese over the bottom of your blind-baked tart crust. Then spread a layer of caramelized onions over that. You may not end up using all of the onions, and you’ll want to reserve at least a few of them to spread over the top later. Over the onions, spread another quarter of the cheddar cheese. 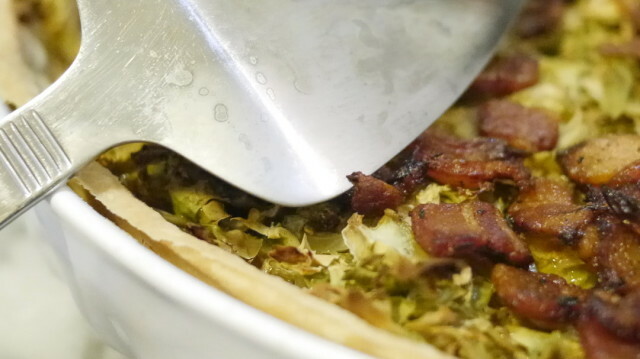 Mix half of the shredded brussels sprouts with the bacon, and then spread it evenly over the top. On top of that, pile the remainder of the shredded sprouts. Again, you may not use all of them. But remember, they will cook down. So don’t worry if there’s a bulge. 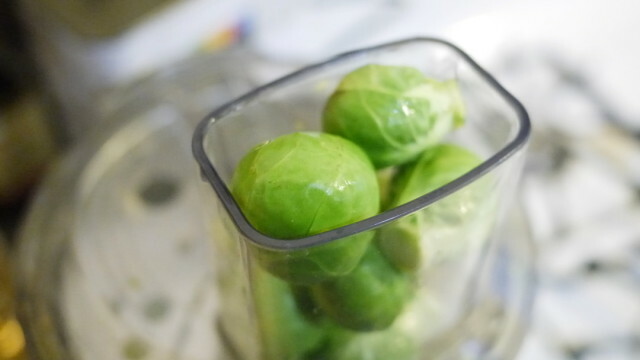 Sprinkle the remainder of the cheddar cheese and the remainder of the caramelized onions over the top of the tart, and bake in a 350F oven for 40-50 minutes, or until the brussels sprouts have cooked all the way through. Allow the caramelized onion tart to cool for about 10 minutes, then cut into eight even slices (carefully — the filling will want to move around) and serve. This is great out of the oven. It makes good leftovers. And the recipe can be upscaled to make as many tarts as you need. This would be great as mini tart appetizers ! ← Go Vote, 2014 Edition.